From mighty dogs, to little kittens, the people who come to HealthUnlocked truly love their animals. Everyday we see people post their bold and inquisitive cats, their fun-loving dogs and fluffy rabbits. Thousands of people have done this in the past year, in fact more than any year before. Many of these photos feature the dog that provides unconditional loyalty, the rabbit that brightens up our day or the cat that provides affection. 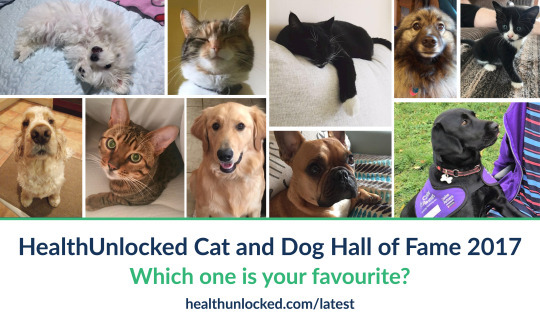 Importantly all of these animals make a big difference to the lives of the people coming to the HealthUnlocked platform, many of which have a chronic health condition. You can tell us your favourite on the HealthUnlocked Latest community. These are just a few of the animal photos on HealthUnlocked (and we would have loved to share them all). Please continue to share your own animal photos on HealthUnlocked communities. Next Entry Did you miss any of the HealthUnlocked Advent Calender?